The Cleveland Flea is a real gem, located at Tyler Village in Cleveland's AsiaTown. We spent some time in AsiaTown a few weeks ago while attending the Night Market, but Tyler Village was a new location for us. The Flea schedule for the rest of the 2015 is as follows -- September 12th and October 10th. You can find the Cleveland Flea on select Saturdays at 3615 Superior Ave. Although there was mainly street parking in the neighborhood, we had no issue getting a spot. It's important to note that we arrived just as the Flea was starting, which likely helped in our parking success. The Flea is in a nice enclosed area, there were several posted vendor maps, chairs throughout the event and a set area of tables near the food trucks. 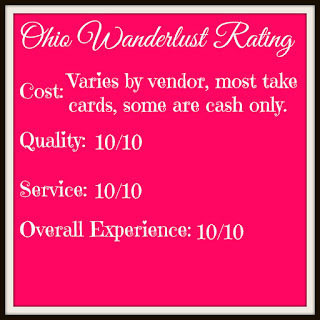 Knowing where all the vendors are is pretty beneficial if you're looking for specific items. We went through the entire Flea and visited each of the vendors anyway, and browsed the huge variety of goods for sale before we started shopping. The Flea Bar serves up a select menu of handcrafted cocktails. We were at the Flea pretty early, so we skipped out on a drink but we have plans to check out the Flea Bar at the next event we attend. A view of the vendor tents. Our first stop was Nathan's Coffee Roasting. I got an iced coffee which they were serving "on tap" and my brother got a hot coffee. 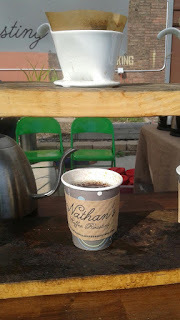 Nathan himself was one of the people serving up the coffee, they had great energy and engaged with us as customers. The hot coffee was brewed pour over style. It takes me forty-five minutes to an hour to drive to Cleveland, so I was pretty happy to start the day with a great cup of coffee. Right next to Nathan's was The Cleveland Bagel Co., the line was pretty long at the beginning of the Flea, so we came back an hour later for a mid-morning snack. The sesame bagel with cherry/goat cheese schmear. The people at this stand were super friendly as well, it's nice to have someone excited to have you as a customer. We really liked the bagel and the cherry/goat cheese schmear was great. While Dave and I got bagels, my brother stopped by the Pierogi Lady, she's one of our favorite vendors from various events we've attended, so I wanted to make sure to mention that she has a booth at The Flea. The Cleveland Pickle enticed us to purchase one of their new pickle flavors, the briny pickles were sitting in a bath of mustard -- I'm a sucker for both, so they made a quick sale. They had samples of everything available, they also sell some varieties of jam. Other vendors were selling art, Ohio and Cleveland inspired tees and jewelry. I was excited to see Lovely Paperie and Gifts at the Cleveland Flea. The owner is an alumna of my alma mater and makes these wonderful Ohio prints, many are university based, filled with places, names and phrases that are special to each location. I finally picked up the Mount Union print I've been wanting, I'm going to frame it and hang it in our apartment. They had a photo area complete with hashtags to help spread "Flea Fever" on social media. We couldn't resist the chance for a photo op. I was surprised how busy The Flea was since we arrived when it first opened, the event was packed from when we arrived until when we left. That's the mark of a good event. These paper flowers are made by Love, Anji and are really gorgeous. They would make adorable bouquets for a special event. At the end of the day we some how ended up back by the food trucks, we just can't stay away from food I guess. My younger brother was very impressed by the Donut Lab. There's a large window where you can watch your donuts being made. They can be hired for parties and weddings -- the Donut Lab was a serious hit with all the kids who watched the donuts being made. Dylan said that the ones he purchased tasted great. The 80 degree weather called for a popsicle, I purchased the watermelon lime flavor from the Chill Pop Shop. The popsicle was refreshing and the Chill Pop Shop's commitment to using local and organic ingredients where ever possible made this treat even sweeter. I had a really fun morning at The Cleveland Flea. My boyfriend and younger brother did too. The flexibility of being able to choose to which and to how many stalls you visit makes this a great event for people of all ages. 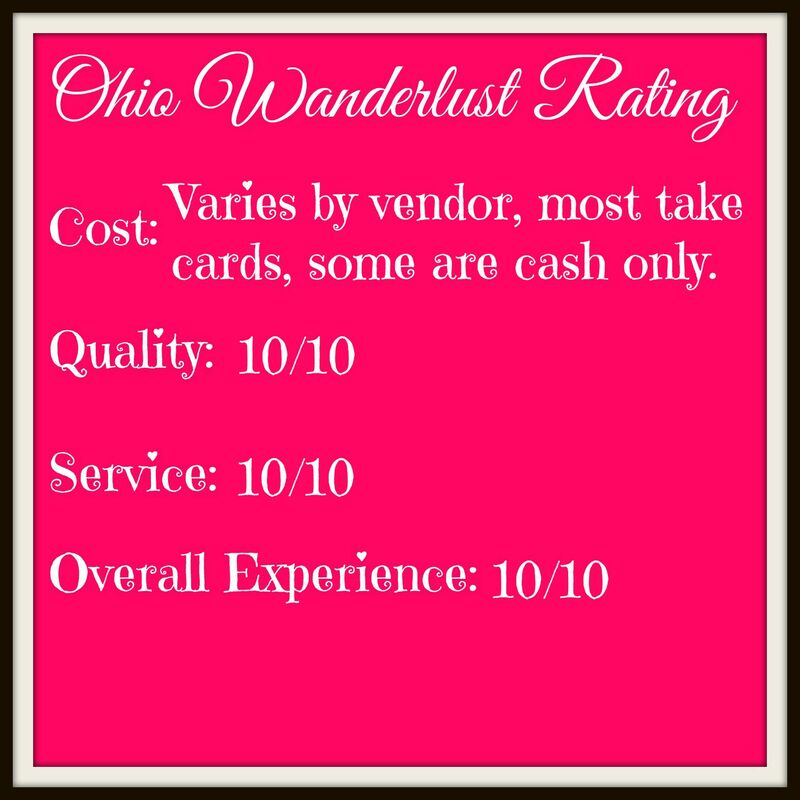 There was a nice variety of vendors and although some items were out of my price range, if you're looking for some one of a kind items and want to shop locally The Cleveland Flea is the place to do that.